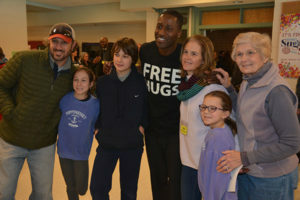 Ken E. Nwadike Jr., aka “the Free Hugs Guy” does what he does best with event attendees. Westborough – On Jan. 21, Connections in Faith, the Westborough Interfaith Association, the Westborough Public Schools, and Westborough Connects co-hosted the first annual Martin Luther King Jr. Community Celebration. The event was grant-funded by the Lilly Endowment along with Islamic Relief. It attracted community members of all ages to reflect and remember the work of Dr. Martin Luther King Jr.
After the words of welcome, the attendees joined together in a song, “Come and Greet the Day”, written and led by Luanne Crosby of Westborough. Amber Bock, the Westborough Public Schools Superintendent read an excerpt from Dr. King’s “Letter from Birmingham City Jail”. Rev. Daniel Gregoire of the Unitarian Universalist Society of Grafton and Upton then shared an excerpt from the commencement address that Dr. King delivered at Lincoln University. The keynote address was given by peace activist and motivational speaker Ken E. Nwadike Jr., who is popularly known as the “Free Hugs Guy”. Nwadike spoke about his previous homelessness, and how he overcame the challenges he faced in high school. He also discussed his charitable organization, The Free Hugs Project. Finally, Nwadike discussed the power of a hug, and how this was manifested when he attended the 2014 Boston Marathon to spread love and encourage runners with “free hugs”. Participants in the celebration transitioned from the auditorium to the cafeteria at Westborough High School, where they embarked on a community art project and roundtable discussions which reflected upon Dr. King’s message. There was also a community “storytime” activity for the youngest participants, where books curated specifically for this event by the Westborough Public Library were read aloud. Attendees went home enriched and inspired after connecting with other community members and discussing Dr. King’s message as a group. You do not need to answer each question below. Instead, they are provided as possibilities to help guide your thoughts and your writing. You are also welcome to respond with your own interpretation of the quote. What thoughts come to your mind when you read this quote? Does this quote make you think of a specific time or event in your life? Explain? Have you been “silent about things that matter” before? What prevented you from speaking up? Does this quote apply to your approach toward life at all? If so, how? When does one die? When does someone truly die? Not when their lungs stop functioning, and their heart stops beating, but when does someone die in the eyes of others? In their own eyes? Martin Luther King Jr. answered this question through a quote that has stuck with people for decades. The great leader once said, “Our lives begin to end, the day we become silent about things that matter.” To this day, we are still taught to stand up for what we believe in and what is right. We don’t have to be heroes and cause a revolution to happen in our world. But we should at least try to be the best we can be. Not only should we show warmth to our friends, but also to our foes. The day we embrace everyone with love, that day all the problems of this world will be resolved. And if they aren’t. Then we will have the strength of unity and friendship to keep challenging us to make our world a better place. When MLK Jr. said this quote in one of his many inspirational speeches, he had a very clear intent on what he wanted to get across to the masses. He was trying to make people understand, that it is vital for one to stand up for what they believe in. A lot of times, what is right, might not always be what is easy. When you try to stand up for the right cause, forces greater than yourself are going to standing against you. When you overcome all the obstacles and push through until you reach your goal, that is when you are a true hero. Martin Luther King Jr. also had to face many problems to get to his ultimate goal. He would have never even been considered a hero, if it weren’t for all the struggles he went through to make sure that colored people had the same rights as white people in America. His speeches and actions should be inspiration to the future generations to stand up for what is right. Some may say, that only people who are older in age, or have more power are the ones that should be standing up for what is right. This false assumption has been proven wrong many times by young heroes who have made immense contributions in our world. What MLK Jr. talked about all the time, and what our teachers and parents now guide us to do, is that we should always be confident in what we’re doing, if it’s truly for the greater good. No age, gender, money or power, can stop anyone from being who they are and standing up for what is right. Following in the footsteps of MLK Jr., let’s all try our level best to keep his words true, and prove ourselves to anyone who opposes us, once and for all. Martin Luther King was an activist, and a hero, who set the path for modern day America. Without his valiancy and passion for equality, life could have turned out very different for generations of African Americans. Dr. King’s quote is timeless. What he means in saying this is that the silence we give fuels our oppositions. If we do not speak up about what we believe in, we are giving them the power. This leads to our defeat, the way our lives begin to end through injustice. Upon reading this quote, I instantly thought of multiple social movements that hold much relevance today. A major one is the “March For Our Lives” movement. They are fighting towards stronger gun control after the senseless gun violence that has been happening in our country. Thousands of Americans participated in their marches nationwide. Eventually, the craze died down. Everyone went back to the way they were before, and didn’t hold that same initiative to fight for gun control. With less of a passion being held, less progress has been happening among the movement. As Dr. King said, we became silent about something that matters. The gun violence is still occuring at similar rates. When people become silent, the issue remains intact. In a world full of corruption, there will likely be times where people hold their silence on important issues. I remember I was in the third grade. My big dream was to join the army and defend our country when I grew up. We were talking about our career wishes in school and who more than my one of own teachers was to tell me that I should consider a different job. She told me girls were not strong enough to fight. She told me only men should be doing those jobs. I wanted to say she was wrong. I wanted to tell her I could do whatever I wanted, and that being a girl made no difference. Though I wanted to, I couldn’t. I was only nine years old and the only thing I felt was an overwhelming sadness at the fact that I was discouraged from doing what I wanted by an adult, just because of my gender. Being older now, I would have responded very differently. Equality is something I take very seriously and I wish my third grade self knew that the teacher was incredibly backwards in her thinking. As a girl, I can do just as much as a boy. Though I may have been a shy girl with passive opinions when I was younger, I hold many firm beliefs now. Dr. King’s quote applies to how I think because I believe everyone should speak up for what they believe in. America is a country that holds freedom of speech above all else, so we must encourage the use of it. Dr. King is the perfect example of a strong American who was not silenced, and we must learn from him. “Our lives begin to end, the day we become silent about things that matter” -Rev. Dr. Martin Luther King Jr.
Our world today can be exceptionally complicated and demanding at times. The recent change in the political and social climate contributes to multiple individuals rising up to their potential for what they believe and finding their voice. We are educated as adolescents to rise above and not be a bystander. Feeling victimized? Tell Someone. Witness bullying? Tell someone. Finally seek advice? Who. Cares. The conflict arises when victims or witnesses experience neglect and ignorance. Many have found themselves a in a social setting where you know absolutely nobody. I personally found myself in this unpleasant position. Despite the position not being ideal, the experience was understandable. What may not be understandable is affecting someone in a manner where they feel excluded from a group. Provided that a significant amounts of kindred souls exist, a select few still decide to practice the act of putting others down. Feeling like a person doesn’t belong or will be judged most likely plays a factor in them remaining silent instead of expressing their feelings. Soft–spoken individuals would perhaps be easier to manipulate. Nonetheless, they are human beings and it is imperative to show respect and kindness. Conforming to society’s “norms” and searching for validation should be frowned upon and encouragement to address issues prominent today (gun control, racism, gender gaps etc.) should be displayed. Nonetheless, they are human beings and it is imperative to show respect and kindness. Unfortunately, awful events have occurred in America and around the world in the past and still continue to today resulting in injustice. In relation to this, the March for Our Lives movement included teenagers who were tired of innocent people being killed and fighting against the lack of gun laws in the country. The march was created in order to speak up against gun violence after the teens were impacted first hand. This activism among the youth may help lead to the smallest impact that could possibly even trigger positive reforms. An Introvert is defined as “a person predominantly concerned with their own thoughts and feelings rather than with external things.” A better description would be a person that dislikes attention and finds it more difficult to establish themselves within a crowd. I often worry about being overlooked or group setting. In spite of that, I am passionate but lack the voice needed to communicate. For instance, there are a vast amount of people who have taken me for granted.. Some of the ones closest to me have betrayed me and turned out to be extremely toxic. I absolutely love having opinions and being passionate but it is difficult when the ones who are your “friends” say awful things and treat you as irrelevant. Quotes about silence being betrayal from influential speakers such as Martin Luther King assist in creating a more positive outlook on life and helping to recover from hardships. The quote guides and encourages others, including me, to participate in discussions and realize that everyone does have a voice no matter if they are told otherwise.